As you may already know, The Séamus Ennis Cultural Centre is a small, non-profit Arts organisation presently promoting their Summer Solstice Session festival as part of The Gathering 2013. Any help and support you can give by sharing the event info is greatly appreciated and we hope to see you in Naul over the weekend of June 21st to 23rd too! To coincide with National Music Day – Love:Live Music Ireland, come along and Try the Uilleann Pipes with instructors from Na Píobairí Uilleann, the Uilleann Pipers. Detailed information and booking is available on our website. Admission is FREE but booking is essential to ensure your place. Bringing to life some of the characters from Séamus Ennis’ 1977 recording for Claddagh Records, ‘Feidlim Tonn Rí’s Castle’, learn to create your own character using pencil and paper with instruction as you sketch. Watch as the artist, Christan Kotey, creates a painting depicting a scene of Irish fireside tales to the soundtrack of the original Claddagh Records recording. On January 13th, 1951, the famous American folklorist, or ‘song-hunter’, Alan Lomax arrived in Ireland to collect material for an album that would become the first LP of Irish traditional music, ‘The World Library of Folk and Primitive Music: Volume II Ireland’. Under advice from George Moore of the BBC, Lomax recruited the great Séamus Ennis, at that point already an established folklorist, to act as his guide. The journey they took visiting villages across Ireland, recording singers and musicians, would later be referred to as ‘The Ennis Trail’, a journey that when examined today, offers a fascinating insight into Irish traditional music. Children’s entertainers, street performers, live music, dancing, food, and more, from 12:00 noon. Live music on our outdoor stage from 3:00 to 10:00pm featuring ‘Clann agus Cairde‘, ‘The David Munnelly Band‘ and ‘The Moog 69s‘. More events to be announced, please check our our website for details! Get your tickets today before they’re gone! Celebrate Welsh culture with us at the Los Angeles St. David’s Day Festival-National Day of Wales on March 3, 2013 at the Barnsdall Art Park! Performances by Aedan MacDonnel, Joe Praml, Welsh Choir of Southern California, Paul Child, Siobhan Owen, and a special screening of the 1962 short film Dylan Thomas starring Richard Burton. Also from 10 to 6pm visitors will be delighted in an outdoor festival featuring a Celtic marketplace, Welsh language classes, workshops, Welsh Corgi demonstrations, storytelling, kids crafts, food and much more! Copyright © 2013 A Raven Above Press, All rights reserved. You have connected with A Raven Above Press and its books and events. Save on Welsh Festival Advance Tickets! ~ Save $15 when you buy two general admission tickets in advance through Indiegogo! Plus 1 complimentary raffle ticket to win a stay at the Dylan Thomas House in Swansea! Normally valued at $55. ONLY 25 of these combo tickets will be available at this price. Also available are great deals on festival shirts, the Welsh nursery rhyme book, and much more! Go to http://www.indiegogo.com/Wales/ for more information and get these exclusive offers while they last. The Los Angeles St. David’s Day Festival – National Day of Wales replants its daffodil roots at the Barnsdall Art Park on March 3, 2013! A Raven Above Press Presents! Inside the Barnsdall Gallery Theatre there will be a special ticketed St. David’s Day Grand Concert beginning at 1:30pm with a Druid blessing, followed by a screening of the rare 1962 short film ‘Dylan Thomas’ starring Richard Burton. After this the Welsh Choir of Southern California (Côr Cymraeg De Califfornia) will take the stage, and then a special performance by Paul Child, and in her debut North American appearance – Welsh soprano and harpist Siobhan Owen! We are all excited by the return of Paul Child to Hollywood. Among his many achievements, Child is Wales biggest independent selling artist, the ‘Official Voice of Welsh Rugby’, and recently sang at the half time show of the final match of the Wales Rugby Grand Slam. Interesting to note, each time he’s sung before a match, Wales has registered a victory. Siobhan Owen was born in North Wales to a Welsh father and Irish mother, and moved to Australia when she was 2 years old. 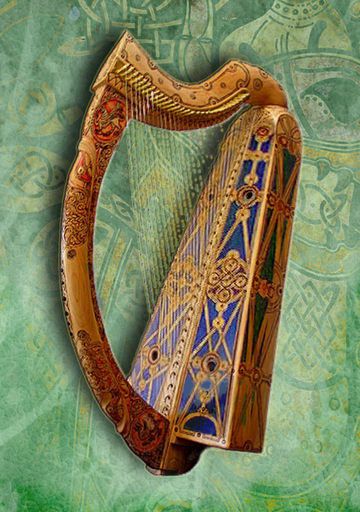 A classically trained singer from the age of 9, Siobhan also turns her haunting soprano voice and gentle harp playing to a repertoire of traditional Celtic songs. 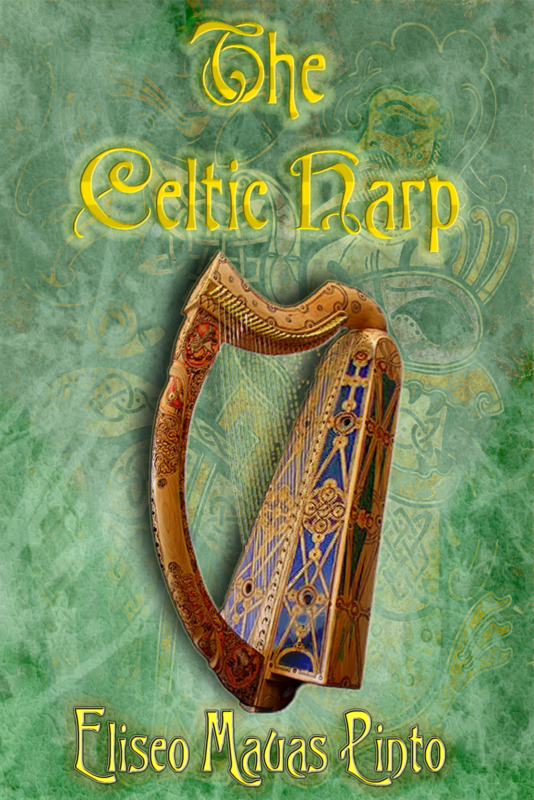 She has received prestigious awards for both her classical and Celtic singing and is a popular performer at festivals, concerts, recitals etc around Australia. Outside the concert beginning at 10am visitors will be delighted in a free Celtic Marketplace, Welsh language classes by Jason Shepherd of the Learn Welsh Podcast, Celtic workshops, Welsh Corgi demonstrations, Kids Crafts at the Ogden Nash Children’s Area, and the LA Eisteddfod featuring poetry, storytelling, readings and performance at the Harold Lloyd Outdoor Stage, Welsh food (pasties and cakes) by the Welsh Baker, and much more. We will be promoting artists from both Wales and the US in a special book release party on Welsh Nursery Rhymes written by Peter Anthony Freeman (Llanelli, UK) and published by A Raven Above Press. International artists include Nathan Wyburn (Abergavenny, UK), Anthony Richards (Ammanford, Carmarthenshire, UK), Siobhan Owen (originally from Llanfairpwllgwyngyllgogerychwyrndrobwllllantysilio, UK now residing in Adelaide, South Australia), Michele Witchipoo (New York City, NY), Kimberly Wlassak (Los Angeles, CA), Rochelle Shelly Rosenkild (Riverside, CA), Brian Kenny (Middletown, NY), Nichola Hope (Barry, UK) Sarah Hope (Barry, UK) Rhys Jones (Swansea, UK), Kerry Evans (Swansea, UK), Jo Mazelis (Swansea, UK), Judy Adamson (Abergavenny, Monmouthshire, UK), Spine Stealer (Los Angeles, CA), Karen Richards (Cleveland, OH), Laurent Castiau (Belgium), Gaabriel Becket (Portland, OR), Xavier Lopez Jr. (Seattle, WA), Jason Shepherd (Swansea, UK), Adrien Burke (Los Angeles, CA), Danny Walden (Bell Gardens, CA), Robert Karr (Westminster, CA), John Charles (Los Angeles, CA), Grasiela Rodriguez (Pomona, CA), Casey Ruic (Cleveland, OH), Daniele Serra (Cagliari, Italy), and Lorin Morgan-Richards (Los Angeles, CA). Also, Sarah Hope from Barry, UK (now in Cardiff) will be in attendance exhibiting a collection of ceramic wall mounted pieces and dinnerware that are decorated with themes from welsh nursery rhymes and stories. The pieces are a collaboration between artists Sarah Hope and Nichola Hope and sculpture Kevin Caufield. & Welsh Choir chorister Caroline will facilitate Ysgol Eisteddfod (School Eisteddfod) to help the youth activate and develop their vocal talents in the arts of poetry, song, comedy and storytelling and their artistic and craft skills! If you weren’t born of Welsh heritage you’ll leave being The Cymry-Mabwysiad (Welsh by adoption). Community Sponsors include Cambrian Heritage Society Madison WI, AmeriCymru, The Welsh Baker, Learn Welsh Podcast, Ninnau & Y Drych, The Celtic Arts Center, Brian Kenny (Dark Corner of the Abyss), Music Wales, Highland Sun, Eugene Hayden, Queens Favor, Red Dragon Management, Choir of Giants Press, Metro. Friend Sponsors include Jude Johnson, Peter Anthony Freeman, The Order of Bards Ovates & Druids, Pan Pipes Magickal Marketplace, Emily Fromm, The National Library of Wales, Celtic Myth Podcast, JOMO – Joanne Morrison, Visit Wales, and the Dylan Thomas Birthplace. Or we’ll be away by the light of the moon. Each and every year we the Celts celebrate Samhain ,the Celtic New Year, or Summer’s End… some in the old ways and some in the Hallow’s Eve way. Originally, Celts celebrated the beginning of the “Long Night” , which is associated in fact to the Winter Season, or the ‘darker half’ of the year. ‘All Hallowtide’ – the ‘Feast of the Dead’, a special moment when the veil that separates us from the Otherworld vanishes, when the dead revisited the mortal world. Thus bonfires are lit to keep evil spirits away, but as it oftenly happens, Catholic Church “sanctified” this “pagan” wide spread rituals, so the night before was known as ‘All Hallows Eve’ becoming known by its contraction form as ‘Halloween’. Additional names for this celebration in Ireland are called “Oíche Shamhna” or “Samhain Night”. Continuing my series of posts regarding this first and most important Fire Festival, let us know a little bit more this year about the Hallowe’en traditions in the Isle of Man. Both the Celts and Norsemen, before the introduction of Christianity, held high festival at the beginning of summer and winter, the mid-winter and mid-summer feasts being more especially of Scandinavian origin. When Christianity was introduced, its ministers, unable to do away with these feasts, wisely adopted their periods as Christian festivals, and so they have continued semi-pagan in form till the present day. The October’s 31st eve , Hallowe’en in English, is called Oie houiney in Manx, and is still kept in the Isle of Man on the 11th of November. The day itself is called Sauin, Souin or yn Tauin, corresponding with the Irish and Scotch Samhain, though the English “Holland-tide” is the name now usually given to the season and to the fair held on the 12th of November. Presently it is also known as ‘Hop-tu-naa’. The etymology of ‘Hop-tu-naa’ is uncertain, some sources speculating that it comes from Manx Gaelic Shogh ta’n Oie, meaning “this is the night”, though there are a number of origins suggested for the similar Hogmanay”, which is the Scottish New Year. This day was formerly the first day of the first month of winter, and also the first day of the Celtic year. A tradition to the effect that it was the first day of the year still obtains among the Manx, who are accustomed to predict the weather for the ensuing year from that on the 12th of November, and this is emphasised by the fact that, as we shall see later, the ceremonies now practised on New Year’s Eve, were, within living memory, practised on the 11th of November. According to the ancient Irish, Samhain Eve was the proper occasion for prophecies and unveiling mysteries. In Wales, within almost recent times, women congregated in the parish churches on this eve to learn their fortune from the flame of the candle each one held in her hand, and to hear the names or see the coffins of the parishioners destined to die in the course of the year. The Scotch believed that all the Warlocks and Witches assembled in force at this season, and perpetrated all sorts of atrocities. Similar beliefs to the above prevailed in the Isle of Man. It was, therefore, very necessary to propitiate the Fairies, who alone were amenable to such attentions, on this night in particular. The leavings of the supper of the family were consequently not removed, and crocks of fresh water were placed on the table, so that ‘the little People’ might refresh themselves. Professor Rhys says that the reason why this night was regarded as “the Saturnalia of all that was hideous and uncanny in the world of spirits” was because “it had been fixed upon as the time of all others when the Sun-God, whose power had been gradually falling off since the great feast associated with him on the first of August, succumbed to his enemies, the powers of darkness and winter. It was their first hour of triumph after an interval of subjection, and the popular imagination pictured them stalking abroad with more than ordinary insolence and aggressiveness.” It was, in fact, the time when the result of the combat which took place in May was reversed; then the powers of light gained the ascendency, now the powers of darkness. Bonfires were lit on Oie Houiney, as on Oie Voaldyn, and for the same reason. Longest of all in Man was Sauin (Samhain) considered New Year’s Day. According to the old style of reckoning time it came on November 12. “To-night is New Year’s night. As in Scotland the servants’ year end with October. New Year tests for finding out the future were tried on Sauin. To hear her sweetheart’s name a girl took a mouthful of water and two handfuls of salt, and sat down at a door. The first name she heard mentioned was the wished-for one. The three dishes proclaimed the fate of the blindfolded seeker as in Scotland. Each was blindfolded and touched one of several significant objects–meal for prosperity, earth for death, a net for tangled fortunes. The ashes of the fire were smoothed out on the hearth last thing at night to receive the imprint of a foot. If, next morning, the track pointed towards the door, someone in the house would die, but if the footprint pointed inward, it indicated a birth. A cake is made which is called Soddag Valloo or Dumb Cake, because it was made and eaten in silence. Young women and girls all had a hand in baking it on the red embers of the hearth, first helping to mix the ingredients, flour, eggs, eggshells, soot and salt, and kneading the dough. The cake was divided up and eaten in silence and, still without speaking, all who had eaten it went to bed, walking backwards, expecting and hoping to see their future husband in a dream or vision. Another means of divination was to steal a salt herring from a neighbour, roast it over the fire, eat it in silence and retire to bed. As fruit to Pomona, so berries were devoted to fairies. They would not let any one cut a blackthorn shoot on Hallowe’en. In Cornwall sloes and blackberries were considered unfit to eat after the fairies had passed by, because all the goodness was extracted. So they were eaten to heart’s content on October 31st, and avoided thereafter. Hazels, because they were thought to contain wisdom and knowledge, were also sacred. Besides leaving berries for the “Little People,” food was set out for them on Hallowe’en, and on other occasions. They rewarded this hospitality by doing an extra-ordinary amount of work. A variation of the nut test is, naming two for four lovers before they are put before the fire to roast. The unfaithful lover’s nut cracks and jumps away, the loyal burns with a steady ardent flame to ashes. And to each nut I gave a sweetheart’s name. If they jump toward each other, they will be rivals. If one of the nuts has been named for the girl and burns quietly with a lover’s nut, they will live happily together. If they are restless, there is trouble ahead. Down the centuries from the Druid tree-worship comes the spell of the walnut-tree. It is circled thrice, with the invocation: “Let her that is to be my true-love bring me some walnuts;” and directly a spirit will be seen in the tree gathering nuts. An apple is peeled all in one piece, and the paring swung three times round the head and dropped behind the left shoulder. If it does not break, and is looked at over the shoulder it forms the initial of the true sweetheart’s name. I fling the unbroken paring o’er my head. In the north of England was a unique custom, “the scadding of peas.” A pea-pod was slit, a bean pushed inside, and the opening closed again. The full pods were boiled, and apportioned to be shelled and the peas eaten with butter and salt. The one finding the bean on his plate would be married first. Candles, relics of the sacred fire, play an important part everywhere on Hallowe’en. In England too the lighted candle and the apple were fastened to the stick, and as it whirled, each person in turn sprang up and tried to bite the apple. This was a rough game, more suited to boys’ frolic than the ghostly divinations that preceded it. Those with energy to spare found material to exercise it on. In an old book there is a picture of a youth sitting on a stick placed across two stools. On one end of the stick is a lighted candle from which he is trying to light another in his hand. Beneath is a tub of water to receive him if he over-balances sideways. These games grew later into practical jokes. The use of a goblet may perhaps come from the story of “The Luck of Edenhall,” a glass stolen from the fairies, and holding ruin for the House by whom it was stolen, if it should ever be broken. With ring and goblet this charm was tried: the ring, symbol of marriage, was suspended by a hair within a glass, and a name spelled out by beginning the alphabet over each time the ring struck the glass. Es un placer compartir con Uds esta edición digital en español de mi libro “Leyendas Celtas de Galicia y Asturias”. Podrán obtener una Descarga Gratis del mismo desde mi página en Smashwords. Escribí este libro con el claro deseo de bucear en el inconsciente colectivo, no sólo recordando las leyendas que escuchaba y leia de niño sino también descubriendo paralelismos sorprendentes. Más que un trabajo teórico se trata de una invitación al descubrimiento de una tradición común, una identidad aún viva que no debe ser ajena a quienes son cultores de lo céltico y a quienes deseen descubrirla. Con el presente trabajo los lectores podrán obtener una visión de los motivos y tipos folclóricos comunes tanto a Galicia como Asturias, gracias a un análisis de los sustratos célticos que imperan en ambas regiones hispanas. 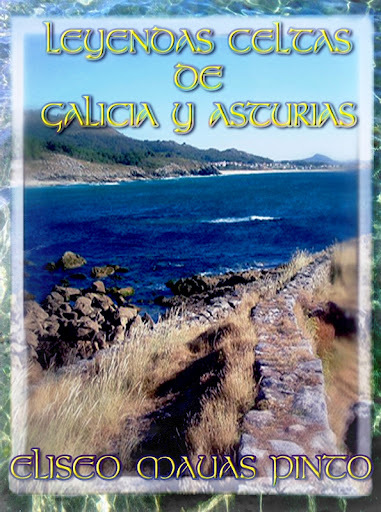 A poco de cumplirse 25 años de la histórica edición en Asturias de mi libro “Leyendas Celtas de Galicia y Asturias” en lengua asturiana, celebro y comparto con todos Uds la reciente edición digital del mismo pero ahora en su version original en castellano. Recuerdo cuando comenzé en el año 1985 a difundir nuestra apreciada música y cultura celta en general, me habia propuesto varios proyectos. 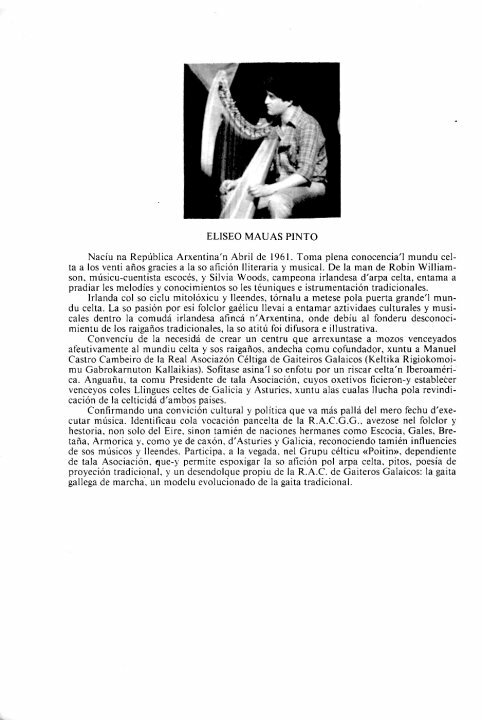 Uno de ellos era editar un libro especialmente dedicado a las leyendas celtas, pero no aquellas que tanto me habian cautivado como las de Irlanda y Escocia sino las mismas que escuchaba en reuniones de las colectividades gallegas y asturianas en Buenos Aires y que tanto me gustaba escuchar y sondear… especialmente las referidas al Trasgo y sus correrias domesticas. Para el año 1987 ya habia comenzado a escribirlo mientras alternaba mis ensayos con Poitín con miras a grabar el histórico álbum homónimo editado en casete y primer registro dedicado enteramente a la música celta con melodias y arreglos originales. Ese mismo año mientras desde Argentina organizaba en conjunto con la Liga Celta de Asturias y La Hermandad Celta de Galicia una presentación ante la Liga Celta Internacional para el reconocimiento e inclusion de estos países como Naciones Celtas, (sólo logramos la condición de “status” como “países miembro” por no tener “lengua celta” según su Asamblea de ese mismo año) le hice el comentario de mi libro a Xesús Llopez Pacios quien por ese entonces presidia la Liga Celta de Asturias. Gracias a su interés en el proyecto gestionó su edición en España y nada menos que en Lengua Asturiana, gracias a la incansable colaboración y traducción del músico y folcorista Daniel García de la Cuesta junto a Isidro Suarez Carballido. Sumando fondos del Principado de Asturias el libro vió la luz en el mismo suelo que fraguó tan hermosas leyendas de Xanas, Trasgus y Cuelebres entre otras tantas. Hoy me place hacerles saber que he decidido editar este trabajo en español. mi libro, y publicarlo como un libro electrónico multi-formato vía el sitio de edición digital Smashwords. Como les adelanté anteriormente, es un trabajo monográfico que he realizado sobre leyendas recopiladas de tradición oral en Galicia y Asturias. Curiosamente no he dado con otro libro de texto en el mercado editorial que haya estudiado o tenido un enfoque similar en este aspecto. 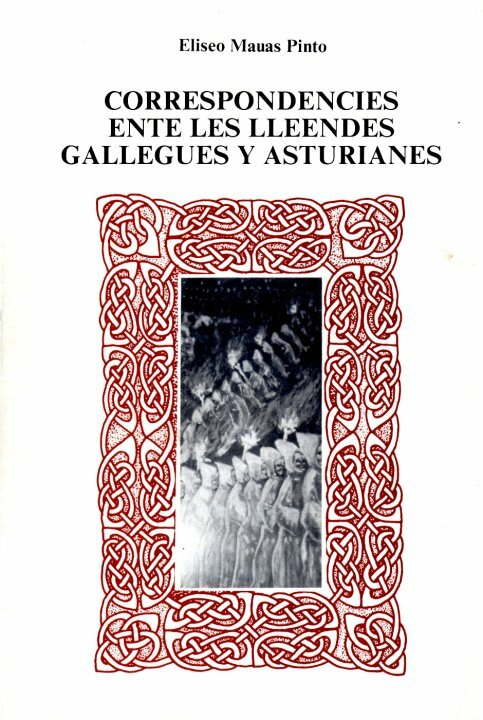 Para quienes les interese los invito a descargar una muestra gratuita de “Leyendas Celtas de Galicia y Asturias” desde este Enlace Directo a mi página del libro,donde podrán incluso leerlo en línea. Un saludo a todos y espero les sea de gran aprendizaje! Leyendas Celtas de Galicia y Asturias by Eliseo Mauas Pinto is licensed under a Creative Commons Reconocimiento-NoComercial-SinObraDerivada 3.0 Unported License. Creado a partir de la obra en www.smashwords.com.